Location: Latitude Guiding is situated in Nelson, New Zealand owned and operated by Mike Kirkpatrick, a professional fly-fishing guide. About your host at Latitude Guiding: Mike Kirkpatrick, Owner. Latitude Guiding consists of head guide Mike Kirkpatrick – proud member of the NZPFGA (NZ’s professional Guides Association). Mike considers himself blessed to be able to guide in one of the most stunning fly fishing playgrounds in the world. 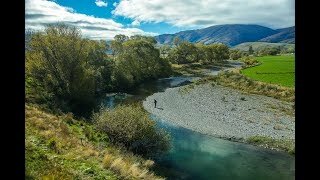 Fishing experience at Latitude Guiding: The Nelson region, at the top of the South Island, provides some of New Zealand’s best trout fishing. It’s a fly-fishing paradise for anglers. The sheer abundance of pristine rivers, and waterways in this region provide literally hundreds of miles of plentiful fly fishing water ~ all within a couple of hours drive. The quality of these waterways is amazing, no two rivers are the same; from the slightly tannin stained West Coast, to the gin clear headwaters of Kahurangi National Park you will be spoilt for choice of the locations available. See our regional map for locations of Nelson fly-fishing rivers & waterways. Click here for quick link country guide. I was born in Christchurch (1964) and moved from there to Nelson about 28 years ago to continue my love affair with the ‘top of the South’ on a permanent basis. As an 18 year old, I used to hop on my first motorbike and head in to the Lewis Pass region (2.5 hours drive) most Friday evenings in summer, camping for the weekend to hunt and fish – sometimes with mates but often by myself. These trips ingrained in me a deep love for the South Islands ruggedly beautiful back country, which time has only served to enhance. What are the fishing/hunting seasons in Nelson, New zealand? To select and book the top suggested hotels and accommodation in the area when fishing at Latitude Guiding click here. by car or public transport to Latitude Guiding.